You will be given a reference e-book to read which has 998 pages And the test will be based on that e-book , you can take the test after 10 days Of purchase. What is the true function of the cost management in the company? Is it the essential one for the company? It is definitely true that the company needs the certified person who can handle any kinds of work closely related to the perfect management for the cost since the management for the cost will determine the progress of the company. By using a monthly report for the supervision of the cost, company will be easy to detect the achievement of the sale and the expenses. This expertise in performing the right management for cost is really crucial for company and the company just wants to hire the certified people to do this job. 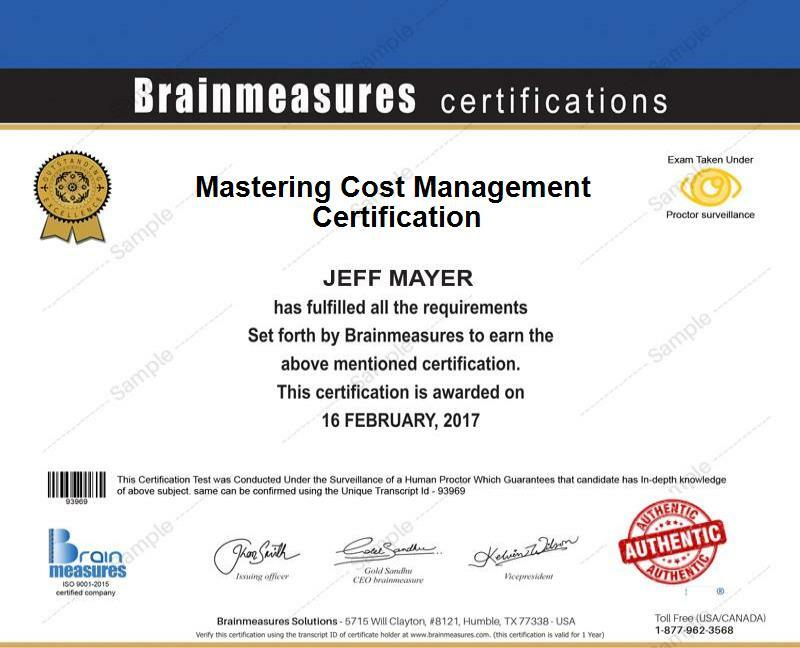 If you are aiming for becoming a part of the team of this supervision on cost, Brainmeasures.com leads you in entering this work in managing the cost by giving the course for handling the flow of the cost. When you have the support of this course then you will not have any fear of taking the cost management exam for attaining the certificate. The exam is the only entrance that you should go through. So, do the best for it and you are going to clear away the distraction as you get the valuable course about doing the great job in terms of managing the cost for the company. If you are quite interested in taking this course, you better learn a little bit about its structure. Mainly, this course is divided into several parts. Each part will tell a lot that it will be so useful in comprehending many things in finance and accounting especially in the section of managing the cost for the company’s great progress. At least, this course consists of three main things. In this section, you are going to be lead in how to comprehend some basic theories of controlling the cost. It will give some new comprehension on the cost control for you. You are going to be taught on how to conduct the process of controlling the cost in some worksheets. It is the practice on showing the great work of managing the cost. The real application on the process of managing the cost can be seen in this phase. Later on, you will see that you have to make a decision in this effort of managing the cost. Some lessons will be delivered to you in terms of making a right decision of this managing the cost. With those great points of basic learning for managing the cost, you will not be afraid of taking the cost management certification. It is going to be easier as you learn well from this course. Mastering cost management will be really great as you intend to get the big amount of earnings. There is no easy way out for obtaining the great earnings. You just take this effort on getting the certification. You make the right step as you try to take the course. When you feel that your income cannot cover your expenses, it is pretty clear for you to get certified for this ability in managing such costs for the company. It is totally easy to get the certification as you find this course from Brainmeasures.com. The certified experts in financial management are getting the great attention from the company. They are totally awarded by the incredible amount of salary for a month. At least, the certified expert in this field will be rewarded by the company approximately for almost $ 30,000 per month. It is such a great salary, right? You should make the immediate step to take this online cost management course and the path of the financial manager in the company is about to achieve. This option of course is the savior for you to encounter the cost management test. You will not get confused in receiving the information related to the way in managing the course. All that you are supposed to do is finding the course provider. Brainmeasures.com will be the right place for you to visit as you have an interest in taking the certification for some field of finance and accounting. The course will tell a lot about the secret of passing the exam for certification. You just need to take the course for the absolute pass for the test.